Discussion in 'Transformers General Discussion' started by Dinotron, Mar 23, 2008.
dont know if this id old of not but i just had this sent to me. is really cool. That was really well done. Props to that guy. Holy crap, that must have taken forever to make. That was really cool, though I don't know what those first two cigarette packs were doing to each other. Nice stopmotion, I like the matchboxes and combiner, sweet idea. I'm now nervously eyeing the 5 packs of Marlboro reds that are just behind me, suppose they might be Autobots though with their colour scheme! That was awesome! I wonder what the combined bots' name is? I guess "smoke-or" would be to cheesy a name for the combiner. is it wrong if i want a condombot? 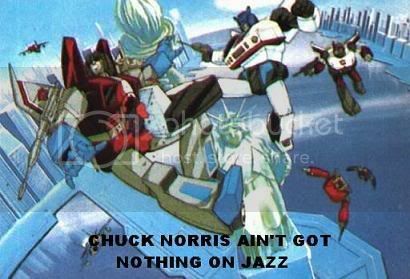 Pretty cool...wish I had spare time..
unicron's blues I need to get rich! so does that make the Durex bot a Protectabot? Wow. Very nice! I'd like to see really good stop motion done with actual TF toys. Wicked. Marlboro Wheeljack would be so proud.